Tri•um•vi•rate /n: A group of three influential or notable people existing in relation to each other. 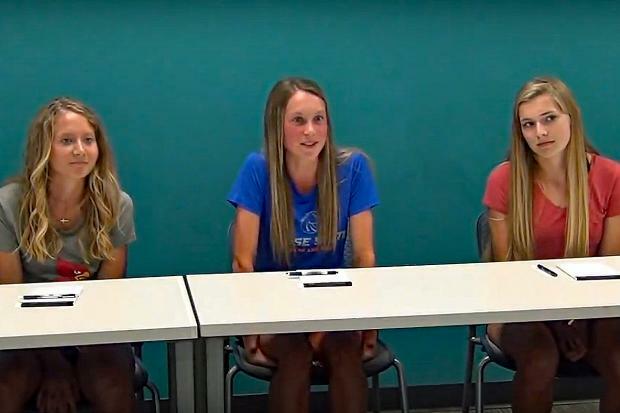 Three exceptional young female athletes, all of whom produced high school marks during the 2016-2017 school year in the top-10 in the U.S. at 5K XC, 1600, or 3200, sat down together in a meeting room at a public library and started talking. The interview was scheduled to last 1 ½ hours, but it went nearly twice that long and covered subjects far beyond the planned update about them since their statistically freakish high school season the year before. Within minutes, I was thankful for the last-minute decision to grab an old video camera because I could tell something special was unfolding, even though the three of them probably didn't realize it at the time. The result was some rare insight into a trio of elite young female distance runners who collectively formed such a potent concentration of high school distance running excellence from such a small population that it called to mind the ingenious coach Arthur Lydiard's trio of Peter Snell, Murray Halberg, and Barry Magee from the tiny island country of New Zealand (population 2.3 million at the time) dominating the 1960 Rome Olympics. Everyone wanted to know how three such amazing runners could come from such a tiny country, and what they learned - Lydiard's "revolutionary" approach of aerobic training for runners from the 800 to the marathon - would change the way distance runners were developed and trained around the world. It was an unusually honest, candid, sometimes poignant, sometimes funny, discussion between not just competitors but friends about a wide range of topics, many of which aren't discussed as openly and candidly often enough. Subjects included middle school sports, training progression, the stress of the college recruiting process, ferritin, making the transition to college, dealing with internal and external expectations, patience, the joy of making each other better, the frustration of an illness or injury, sleep, diet, recovery...well, you get the idea. But in order to understand why what they had to say on those subjects merits serious examination, it's important first to know why, collectively and individually, their 2016-2017 year called to mind what Lydiard's group did in Rome. Despite coming from the non-altitude state of Kansas with a population of only 2.9 million people (just 0.889% of the total U.S. population), then-seniors Cailie Logue (Girard HS/Iowa State, 4:41.30c/10:09.97/16:45.75 5K XC), Emily Venters (Lawrence Free State HS/Boise State, 4:49.36/10:16.61/16:56.00 5K XC) and then-junior Molly Born (Shawnee Mission Northwest/Oklahoma State, 4:48.87/10:07.80c/16:49 5K XC) combined that year to produce performances across two seasons that were such a disproportionately high concentration of elite high school performances in such a small population that it may never be repeated. The three Kansans ended the 2016 high school cross country season with the #4 (Logue, 16:45.75), #6 (Born, 16:49.30), and #9 (Venters, 16:56.00) performances in the U.S. at 5K XC. By contrast, California and Texas combined, with a combined population twenty-three times that of Kansas, could manage only a total of three in the top 10 between them. In track, they would end the year with #8 (Logue), #9 (Born) and #16 (Venters) times in the U.S. at 3200. New York and Texas combined, with a combined population seventeen times that of Kansas, only had a total of two in the top 16 between them. The states of New York and Texas combined couldn't even equal what the Triumvirate from little ol' Kansas did. Clearly, this is a unique, very special triad of young women. While each was among the best in the nation individually, their whole may still be greater than the sum of their parts. What, if anything, can be identified that produced such an improbably high concentration of simultaneous elite athletic performances in such a small population? What, if anything, can be learned from the Triumvirate that might apply to others? There are no immediately apparent answers or similarities. Logue is from a town of less than 3,000 with no stop lights, Venters from a stereotypical Midwestern college town with a population of about 100,000, and Born is from the suburbs of the greater Kansas City metropolitan area, which has a population of more than two million. Only Logue had parents who were college runners, at Division II Pittsburg State, Born's mother played tennis and her father played football at NAIA Baker University, and Venters's parents weren't college athletes. However, on closer examination, a number of significant commonalities do exist between them. The answers to those "why" and "what" questions can likely be found in the commonalities all three shared regarding their progression, lifestyle, and approach to the sport. Some of those commonalities may seem counterintuitive and even run contrary to the current culture prevalent in youth sports, much like Lydiard's methods ran contrary to the heavily interval-based anaerobic training at the time. In the last couple of decades, youth sports culture has seen an ever-increasing emphasis on highly structured and regimented programs, frequent and higher-level competition at progressively earlier ages, early specialization, creating early expectations, both internal and external. This culture stubbornly persists despite mounting data that such early specialization, success, and expectations may actually be counterproductive to achieving long-term, higher-level performance, especially in the case of young female distance runners. But perhaps that is precisely what makes what they had to say and what they did so significant and worthy of study. Their stories are strikingly similar on many significant issues, and those stories bear little or no resemblance to the youth sports culture just described. Maybe, just maybe, what the Triumvirate has demonstrated is that, at least in the case of the early careers of young female distance runners, the road best traveled to maximized potential is paved more with initial patience than with early races and "success," more with variety than specialization, and more with joy than expectations.